Renfro Foods Inc. started humbly from the garage of George and Arthurine Renfro in 1940. 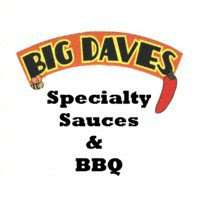 The couple first sold spices and pepper sauces in the Forth Worth area. The Renfros later branched out to include syrups, sauces, chow chow. After George's death in 1975, the next generation of Renfros continued to grow the business. Riding the wave of increased demand for Mexican foods, Renfro Foods Inc. began producing gourmet, all natural salsas. 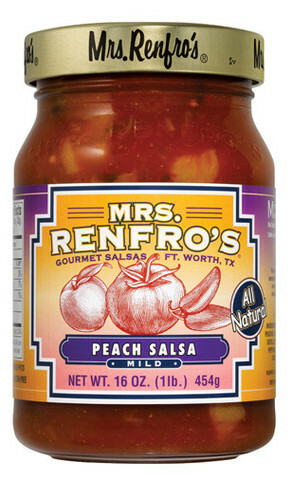 Today, Renfro Foods Inc. produces dozens of products, including a wide selection of salsas under the Mrs. Renfro's name. My wife and I are both salsa fanatics so I couldn't have been more excited when a package of Mrs. Renfro's salsa arrived this week. The sample pack contained 16 oz. glass jars of Mrs. Renfro's BBQ Sauce, Peach Salsa, Ghost Pepper Salsa, and Habanero Salsa. I wanted to dig into the salsa right away. Rather than scorch my tongue, I decided to ease into things and open up the jar of Peach Salsa. Mrs. Renfro's Peach Salsa starts with dark red tomatoes and accents them with sweet peaches, onions and a variety of peppers. In addition to the peaches, the salsa is sweetened with both brown and white sugar. Traditional salsa flavor elements like vinegar, cilantro and garlic are also present. The salsa has a smooth, mild flavor. It's slightly sweet with the peach acting as an accent. The sweetness makes the salsa a perfect compliment to salty tortilla chips. The flavors blended so well that we blazed through the entire jar the same night it arrived. Because we devoured the salsa so quickly, I wasn't able to test it on multiple dishes. I can, however, highly recommend Mrs. Renfro's Peach Salsa as a dip for tortilla chips. If you can keep the jar around long enough to share with guests, it would make a great party dip. It's mild enough for everyone to enjoy and the unique peach factor makes it a bit more special than regular tomato salsa. To see the whole Mrs. Renfro's product line, check out their website. See how their Peach Salsa rates on our "Product Reviews" page. 0 Response to "Mrs. Renfro's Peach Salsa"